A traumatized veteran’s vision of Jesus leads him to renounce everything he owns and join a fraternity of oddball eccentrics in gospel poverty and homelessness. Pvt. Francis returns from serving in Iraq as a broken alcoholic who has lost all passion for life. An encounter with a fellow veteran, now destitute, initiates a spiritual crisis that leads the young man to renounce his family’s wealth and to seek out a more meaningful life among the homeless and rejected on the streets of Brooklyn. Soon a growing fraternity of assorted and eccentric oddballs form around Francis as these modern day friars seek to muddle their way towards enlightenment. A series of funny and often irreverent vignettes, adapted from the true story of St. Francis of Assisi, all illustrating the simplest joys of a life based on humility, faith and compassion. Though known now primarily as the patron saint of animals, St. Francis dedicated himself to a life of absolute poverty and service in accord with the literal dictates of the Gospel. In doing so, he provided a radical example of life lived in accordance to the teachings and examples of Jesus to a world obsessed with power, wealth and glory. This modern adaptation of his story is based on the current understanding of the real St. Francis as well as a number of fables and legends of the man and his fellow “lesser brothers” as relayed by his contemporary admirers. 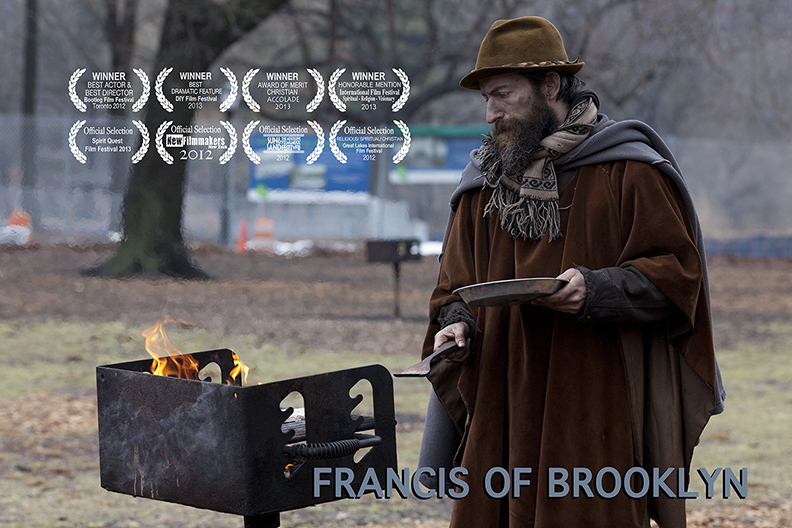 Francis of Brooklyn was shot over 9 months in and around the streets of Brooklyn and New York.